The great batsman K. S. Ranjitsinhji, known to all and sundry simply as "Ranji", was born to an extensive family of princely Rajputs in 1872. His birthplace, Jamnagar, was a city in Nawangar; one of a cluster of native-ruled states on the north-west coast of India, towards what is now the frontier with Pakistan. The situation of these native-ruled states was anomalous: they were seen as part of Britain's Indian Empire, but were technically sovereign states in alliance with the British Crown. Ranji's home state contained about a third of a million inhabitants, and its princes lived extremely lavishly in vast palaces, but the land was arid, liable to droughts and subsequent famines; it was economically backward and riven with typhoid and cholera. One oddity was that its ruling princes, despite having extensive harems, often failed to father male heirs, thus leading to confusion over the succession. The Rajputs were traditionally ferocious warriors, and by Ranji's day supplied soldiers for the British army in India. The British Viceroy in India kept a careful eye on the native states: British representatives "advised" their rulers, and the young princes were encouraged to attend special schools where they would learn English ways; sport being an essential part of the curriculum. Accordingly Ranji, at the age of 8, entered Rajkumar College in the town of Rajkot. (This began an odd coincidence, which endured throughout Ranji's life, with Gandhi, just three years older, whose father had been chief minister there for several years. Gandhi also received an English-style education, though not at Rajkumar). Here Ranji gained his first experience of cricket. By the age of 16 he was excelling at the sport, and also at gymnastics, tennis and racquets; and he won prizes for his recitation of English poetry. It was therefore no great surprise that in 1888 he and two other young Kumars (princes) were selected to be taken to England to further their education at Cambridge University. Ranji was at first educated by a private tutor, before matriculating at Trinity College in 1892. At Cambridge he was, from the start, determined to improve his cricket. Apart from playing in matches as often as he could (sometimes two in a day!) he hired some of England's leading Test Match players, like Richardson, Lockwood and Hearne, to bowl endlessly at him in the nets. (Imagine any student doing that nowadays!). Ranji was fast on his feet and was blessed with good eyesight and strong, supple wrists; and because he had never been formally coached as a youth, was willing to attempt shots no-one had ever seen before; particularly deflecting straight balls behind square on either side of the wicket. He duly achieved his "blue" for playing in the annual match against Oxford in 1893. 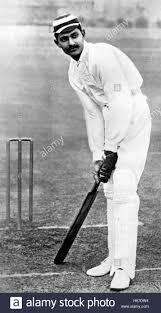 He did not score many runs in that match, but, more importantly, he made the acquaintance of C. B. Fry, a member of the Oxford team, who was to have a tremendous influence on Ranji's life. Fry was one of Britain's greatest sportsmen of all time: he played in an F.A. Cup Final, broke the world record for the long jump, and was unlucky not to get to play rugby for England; but cricket was his greatest love. Unlike Ranji, who played by instinct, Fry had a scientific, analytical approach to the game. When Ranji produced the "Jubilee Book of Cricket" in 1897, it seems that much of the book was in fact the work of Fry. It was largely because Sussex was Fry's county that Ranji decided to make it his cricketing home, for he had no previous connections there. Although he never took up permanent residence in the county, dividing his time between a hotel in Brighton and the rooms he retained in Cambridge, he played full seasons for Sussex every year from 1895 to 1908. Like all cricketers, he had the ocasional failure, but his batting average for each season never fell below 45, and his rate of scoring was always very fast. In all first-class cricket he amassed 72 centuries. He was also an excellent slip field, and could bowl off-breaks when required. Keen and knowledgeable followers of cricket who watched him bat were amazed. The more literary among them indulged in metaphors about the mysteries of the Orient: the bat as a wand, Ranji "conjuring" runs or springing like a panther on a loose delivery, and so forth; whereas the old professional Tom Wainwright was reduced to saying, "Ranji? He never made a Christian stroke in his life!" 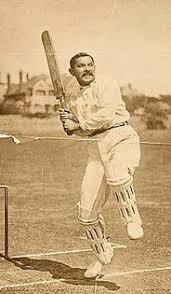 It came as no surprise that in 1896 Ranji was selected for the England team against the touring Australians. After having been surprisingly omitted from the first test, he was called up for the second, at Old Trafford, and although England lost, he enjoyed a sensational debut in an exciting match. Coming in at number 3, he scored 62, and then, as England were forced to follow on, dominated the second innings by hitting 154 not out in a little over three hours. The England total of 305 left the Australians needing just 125 to win the match, and although Tom Richardson then bowled 43 overs unchanged, taking 6 for 76, they sneaked home by 3 wickets. The press were loud in Ranji's praise. In his career in England, Ranji never encountered any serious racial prejudice or discrimination; and indeed spent two years as captain of his county. He was, after all, a prince, he had been to Cambridge, he was an excellent host, always very generous to guests and friends, a good speaker (described as "unaccented"), and loved the traditional country sports of shooting and salmon-fishing. In consequence he was always in demand socially, and was at ease in all company, up to and including members of the royal family. Ranji's county career came to an abrupt end in 1908, though he did return for a full season in 1912. The reason was simple: after the death of a cousin he became the ruler of his state, with the approval of the British Raj, and was now officially the Jam Saheb of Nawangar. He threw himself into improving his impoverished state; clearing slums, building roads and railways, establishing irrigation schemes and creating a port for the pearl-fishing industry. This was how the British expected native princes to behave; though he also lived in great spendour and spent vast sums entertaining visiting dignitaries, including many of his old cricketing friends. He never married. He always enjoyed the company of attractive ladies, and it was said that he had a discreet relationship with an English girl, but as an Indian Hindu prince he could never marry her. All this was very different from his princely predecessors, who had numerous wives as well as the usual harem stock of eunuchs and dancing girls. Ranji dismissed all of these on his accession. When war came in 1914, Ranji, in common with almost all the Indian ruling princes, immediately offered the services of his state to the British government. He provided soldiers and paid for medical facilities and transport, and was commissioned as an honorary Major, but, much to his disgust, was never allowed to go anywhere near the front line. He did, ironically, suffer a serious wound unconnected with the war, because in summer 1915, whilst with a shooting party in Yorkshire, he was blinded in the right eye by a clumsy friend. For the rest of Ranji's life he wore a glass eye, and a doctor had to bathe the eye socket every day. In 1920 there came a completely new development, when he was chosen to be one of three representatives of India at the Assembly of the League of Nations in Geneva. He took C.B. Fry along as an advisor, and when nominated to the Finance Committee, asked Fry to act as his Substitute Delegate. A few years later a crisis arose when Mussolini occupied the Greek island of Corfu, and the former British Prime Minister Arthur Balfour asked Ranji to deliver a speech in response. Fry wrote appropriate paragraphs which Ranji read out, and Mussolini withdrew. It was at this time that Fry was approached by a delegation from Albania who offered to make him King of their impoverished mountain country; an offer which Fry, probably wisely, turned down. Ranji also turned down an invitation to become a member of the Permanent Council of the League. Ranji's cricketing days were now behind him, but he found consolation in the success of his nephew Duleepsinhji, who by 1929 was playing, like Ranji before him, for Cambridge University and Sussex. Duleep was a more orthodox batsman than his uncle, but equally effective. Ranji was proud to be present at the second Test against the Australians in 1930, when Duleep scored 173 on the first day. As it happened, this innings was eclipsed by the young Don Bradman, who made 254, and Australia won the match comfortably. Bradman remarked that Duleep's off-driving was so powerful that, after fielding at cover and mid-off to him, he was obliged to get his hands bandaged. But, as with Ranji, Duleep's career was sadly cut short. His health broke down and he was unable to go on the 1932-3 tour of Australia (the infamous "bodyline tour"). His place was taken by another Indian nobleman, the Nawab of Pataudi, who duly maintained the tradition by scoring a century in his first Test. Ranji's world, the world of the Indian princes, was changing beyond recall. The Montagu-Chelmsford Reforms opened up senior ranks in the Indian civil service to native Indians, and the aim of the British government was clearly to bring a degree of self-government in India. Ranji attended the Round Table Conference, but so did Gandhi, who had abandoned his career as a barrister and now wore just a loincloth and cloak, and brought along a goat to supply him with milk. Winston Churchill was disgusted. Caught between the British moves towards democracy and Gandhi's call for a boycott of British goods, what place was there for the independent princes? None at all, it would seem. Ranji had always been a strong supporter of the British Empire in India, but in 1933, in his capacity as Chancellor of the Chamber of Princes, he had to endure a public rebuke from the Viceroy, Lord Willingdon. It saddened him very deeply. In 1947, Mountbatten forced the princes to merge their states in an independent India, whether they wanted it or not. Ranji did not live to see this. All his life he had suffered from athsma attaks and other respiratory problems, and in spring 1934 he fell seriously ill. After several days of violent coughing, he died on April 2nd. He was given lavish obituaries. The Ranji Trophy, the most prestigious contest in Indian cricket, is named after him.